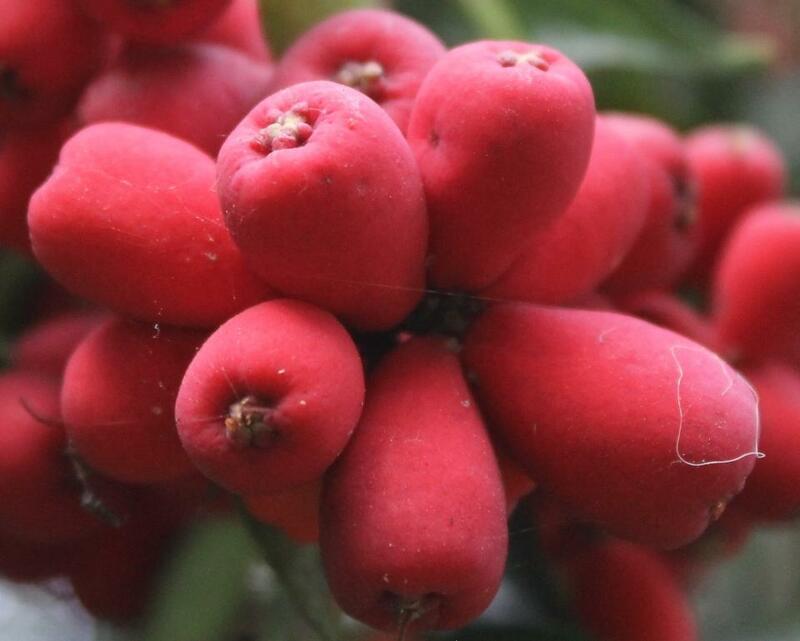 Around this time of year we notice trees and hedges heavy with lilli pilli fruit. Having had beautiful jams, tarts and ice creams mixed with wattleseeds made using this fruit, we thought it may be high time to share a few favourites we've used in the past to ensure this Australian native fruit isn't strictly for the birds. If you’re planning to eat and/or cook with Lilli Pillies, please note that there is a hard little seed in the centre of the fruit. It’s easy to remove the seed by squashing the berry between your fingers. Also don’t use those that grow beside roads and may have car fumes on the skin of the fruit either. A simple rule with jams when using any fruit is once cup of sugar to one cup of fruit whether you're making strawberry, apricot or even marmalade. Simmer the Lilli Pilli fruits in water for thirty minutes, to soften the fruit and release the pectin, which helps the jam to set. The color of the lilli pillis will change at this point, but the jam will still turn out a lovely pink in the end. The Lilli Pilli jam will begin to set after about fifteen minutes of boiling. When the jam has reached setting point, pour it into sterilized jars*. Seal and label the jars when they are cooled. Great on buttered toast or scones or in jam tarts or dressed up with special trims for gifts of something uniquely Australian. For those who like a nice relish to have with savoury dishes. If you want something a little 'hotter' throw in 4-5 chopped red chillies. 4- 5 cups of fresh, ripe lilli pilli fruit-- if using smaller varieties you will need the 5 cup measure - it is a good idea to deseed fruit prior to cooking to stop any slipping through. Put all ingredients into a pan and simmer slowly for around 2 hours or until the mixture thickens. Put through a fine sieve if the lilly pilly fruit contain seeds that you haven’t deseeded prior to cooking. Place into sterilised glass jars* (reuse/recycle glass jars for this purpose). * Sterilising jars: wash jars and lids with hot, soapy water. Rinse well and arrange jars and lids open sides up, without touching, on a tray. Leave in a preheated 120°C oven for 20 minutes. Or, boil the jars and lids in a large saucepan, covered with water, for 15 minutes. Any muffin or cake you make using a berry fruit can be adapted to the Lilli Pilli! This is a standard muffin recipe with Australian Lilli Pillies substituted. Using those that are larger, like the pink version, makes them juicier and it’s easier to remove the pit prior to placing in any dish. You can also substitute seasonal ingredients to celebrate what crop is coming in and at its peak in sweetness and freshness. Always ensure you use those grown away from main roads – you don’t want car fumes all over the fruit’s skin being ingested. Preheat oven to 190°C/170 fan-forced. Line a 12 hole, 1/3 cup-capacity muffin pan with paper cases. Combine the flour caster sugar and brown sugar in a bowl. Make a well in centre. Spoon mixture evenly between paper cases. Bake for 20 to 22 minutes or until golden and just firm to touch. Stand in pan for 5 minutes. Transfer to a wire rack to cool. Peel 7 apples and 6 pears and chop into small chunks. Place in a saucepan with 60gm sugar and 250ml water. Cook 30 mins. At the last minute add 100gm lillipillies (riberries). Stir and then transfer the mix to an oven dish. Rub together one cup of flour and 2 Tablespoons of butter until it looks like breadcrumbs. Mix in half cup each of brown sugar and rolled oats. Pat the crumble mix over the lillipilli/apple but do not tamp down too much – you want a crisp top. Syzygium luehmannii is a medium-sized coastal rainforest tree native to Australia. Common names include riberry, small leaved lilly pilly, cherry satinash, cherry alder, or clove lilli pilli. 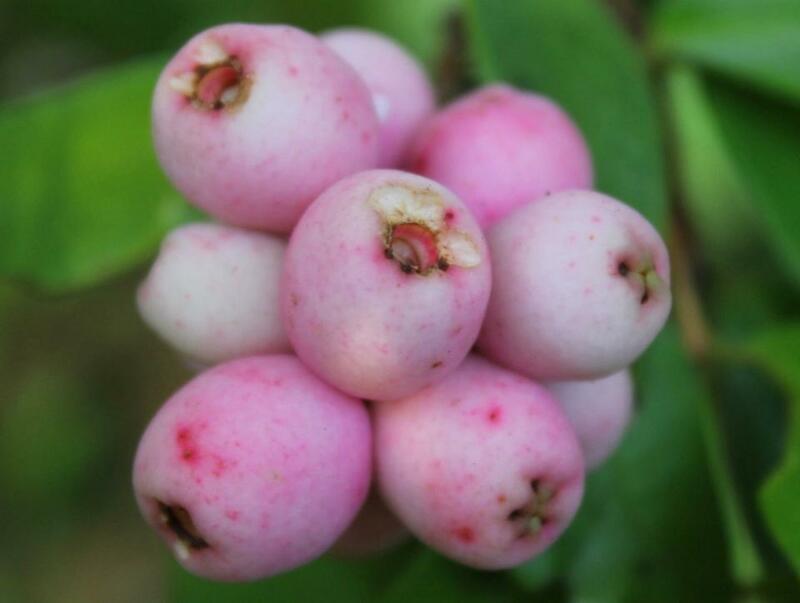 Syzygium is a genus of flowering plants that belongs to the myrtle family, Myrtaceae. The genus comprises about 1200 species, and has a native range that extends from Africa and Madagascar through southern Asia east through the Pacific. Its highest levels of diversity occur from Malaysia to northeastern Australia, where many species are very poorly known and many more have not been described taxonomically. Fifty-two species are found in Australia and are generally known as lillipillies, brush cherries or satinash. The habitat is Australian riverine, littoral, subtropical or tropical rainforest. It grows on volcanic soils or deep sandy soils between the Macleay River in New South Wales to near Cairns in tropical Queensland. It is commonly grown as an ornamental tree, and for its fruit, known as a Riberry. The small, glossy, lance-shaped leaves are a shiny green when mature, but pink/red when young.The fruit matures from December to February, being a pear shaped red berry, known as a riberry, growing to 13 mm long, covering a single seed, 4 mm in diameter. Seed germination is unreliable, complete after 25 days, however cuttings strike readily. The fruit is eaten by the Australasian figbird and emu. The tree commonly only reaches 8–10 metres in cultivation. The berry has a tart, cranberry-like flavour, with a hint of cloves. It has been popular as a gourmet bushfood since the early 1980s, and is commercially cultivated on a small-scale basis. The fruit is most commonly used to make a distinctively flavoured jam, and is also used in sauces, syrups and confectionery. It can also be eaten and enjoyed straight off the tree. The riberry plant is also very popular as a garden ornamental and street tree. It is easily maintained as a smaller tree by light pruning.